Axis Of Oversteer: 991 GT3s are so hot they are catching on fire. Remember when the first batch of Ferrari 458 came out with a tendency to spontaneously combust? You sort of expect this from Italian exotics but zee Germans? They are serious people who would never make engineering mistakes, would they? What is the world coming to: There are reports Porsche has suspended deliveries of all 991 GT3 until they figure out why they catch on fire with alarming regularity. 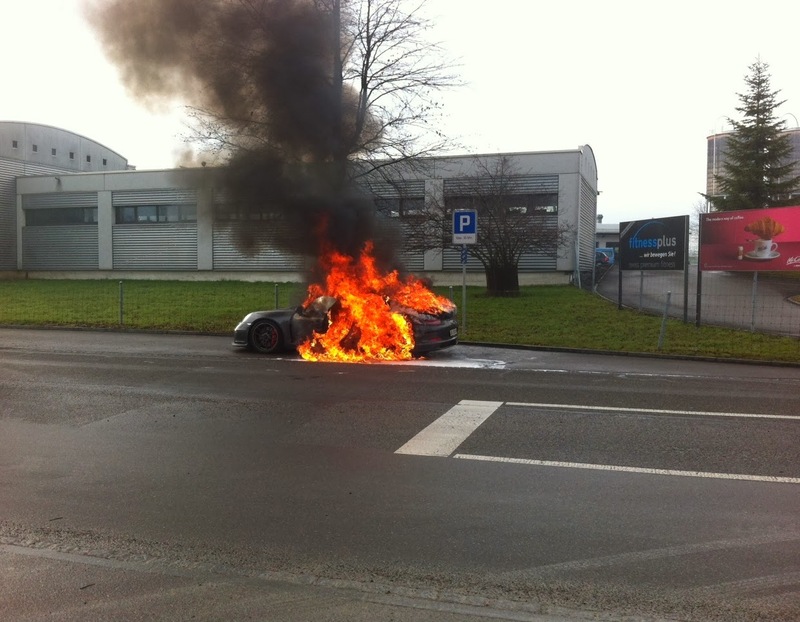 On Wednesday (02/05/2014), at 11 clock, a Porsche has caught on fire on the Wilerstrasse. Firefighters were able to extinguish the fire. The car suffered a total loss in the amount of CHF 200'000. A Porsche GT3 drove on the A1 highway towards St.Gallen. When the driver perceived strange noises from the engine area, he left the highway. On the Wilerstrasse the driver stopped the car. He saw leaking oil and smoke is in the rear engine. A short time later the Porsche caught fire. The fire was extinguished by the fire department. The cause of the fire will be investigated by the Forensic Science Service of the Canton of St. Gallen police. I am the administrator of Porsche Club Campania, an Italian Porsche club. A member of our Club last Saturday was near Avellino, in the south of Italy, his gt3 was really new, just 60kms. First the warning LOW OIL PRESSURE in the display and after few seconds his GT3 was burning. The gt3 DESTROYED is now at the PORSCHE CENTER NAPOLI and this morning an engineer from Stuttgart came here to see the car. It is the 5th gt3 in Europe that burned with the same problem. It seems that Porsche already know where is the problem but I don't know if the dealer will be able to fix the problem. I will keep you updated. Maybe keeping that Mezger engines on the Supercup cars was a good idea. This story has since been picked up by Jalopnik, Road & Track, New York Times, Sport Auto...just to name a few. Atlanta. The sports car producer Porsche is inspecting all engines of 911 GT3 vehicles of model year 2014. Porsche is informing the owners of the affected vehicles directly and recommending that they stop using their vehicles. The company is offering to pick up the vehicles and take them to a Porsche Centre immediately. Safety is a number one priority at Porsche, and the company takes its responsibility seriously. After engine damage occurred in two vehicles in Europe and the vehicles then caught fire. Porsche decided to inspect all 785 delivered vehicles worldwide. There was no traffic accident and no personal injure. Internal studies to determine the cause of the engine damage have not been completed yet. I agree with your comments regarding mechanical engineering and "zee Germans." German engineering is just about as good as you can get. It reminds me of the line in the movie Donnie Brasco, when Michael Madsen's character is driving his new Mercedes and he comments, "Man I can't believe the ride on this thing. I can't believe they lost the way, them Germans." Some have speculated that Porsche has been testing the 991 GT2 at The Ring. The spy shots on that thing look killer. Has axisofoversteer become the tabloid news of the motoring world? One 991 is pictured on fire, and based on solid evidence (/sarcasm) this has become a massive problem across the board? TBH I would rather this place not post this dribble. Yeah it's Mezger you dweebo! Hang on, 5 just delivered GT3s have caught on fire and it looks like Porsche is sufficiently worried to (correctly) halt deliveries until the problem is found and it's not news? Perhaps they could combine the problems that they had with the Mezger engine. The water jackets blowing apart would put the fire out. They are throwing rods and these are punching through the case spraying oil all over the place which of course is cauing the fires. They have determined that a retainer is the issue - specifically the wrong torqe was applied. The problem is that the automated tool used to tighten the retainer (bolt) was inconsistently torqued over several months - some stupid software issue. Thats a BIG problem becuase they cannot assign a group of engine serial numbers to the issue for serial number specific recalls. Soooo... every engine made (!) from day one until production was halted and has to be removed and replaced with engines that have been checked before leaving the factory. Owners have been asked to stop driving their cars and their cars have been flat towed to local dealers where they have all been parked awaiting engine changes. All of the owners are getting loaners until their cars are ready. There has been no word of financial compensation for loss of use but there has been a suggestion of an extra year of warranty mentioned by some dealers. There has been no word on the fate of the removed engines IE, will they be checked and reused or trashed. I highly doubt they will be reused considering some had already had several thousand km's put on them. Most of these 991 based GT3's were European models with only 200 US vehicles actually delivered. I know one owner whom was to have a factory pick up with a three week holiday that has now been ruined because Porsche cancelled his June pick up. To say he is pissed off would be an understatement. He is now pressuring them to give him a loaner 991S as his airfare and hotels were non-refundable and he's going anyway. 785 engines are affected at of a cost of 25k € each (low end est) plus dealer costs... A conservative esimate is that this screw up cost well over 30M € without changes to procedures at the factory. Leading Web Portal Development Company develops all types of web portals like travel portal, real estate portal, education portal, Ecommerce portal, job portal and customized Web Portal Development at your budget and affordable cost. I have made a huge collection of Happy Easter Day Images and pictures...Go and get them for free. Porsche cancelled his June pick up. To say he is pissed off would be an understatement. i am in complete favor of author and i must say they are doing right thing to manage all the stuffs.